There must, I suppose, be a limit to how far the mission statement of a “book” review section can be stretched. I did take the view that some of the booklets we have covered in the past were probably as far as we could go, but then everything has to evolve and, on reflection, it has been decided that any item of memorabilia that consists primarily of the printed word comes within our remit. If in light of the above observations any reassurance is needed, we are not about to unleash a series of reviews of match programmes, tour brochures and magazines, and we will only be pushing at the boundaries (pun intended) occasionally and when a particularly interesting item crops up, as in this case, a programme from the visit of Donald Bradman’s ‘Invincibles’ to these shores in 1948. The last two matches of the tour were in mid-September and were two day affairs against Scotland, the first in Edinburgh and the second 130 miles further north in Aberdeen. I am not aware of any sort of souvenir brochure being produced for the first match, but the Aberdeenshire Cricket Club produced this gem for the game they hosted, the last time the Don wielded a bat in anger on British soil. Wartime paper restrictions had, so I understand from my 1963 Wisden, been eased in 1948 although they did not end until the following year. That in itself makes the production of the brochure particularly impressive. The wrappers are in full colour and whilst the inside pages are not they do still have some colour, plenty of well reproduced photographs and the sort of imaginative typesetting design that would not become the norm, at least not amongst cricket brochures, for many years to come. The match itself attracted what Wisden described as a ‘record crowd’ of 10,000, although the Almanack is silent as to whether that is for a game in Aberdeen or one anywhere in Scotland*. Either way one suspects that there must have been plenty of copies of the brochure printed, and given that it fully deserves its description as a ‘souvenir’ it is difficult to imagine too many being readily consigned to the rubbish bin. In the circumstances it must be expected that plenty of copies have survived, and indeed it is a title seen on the market from time to time, although the price is always high. So what do you get in the 24 pages? For a start there are six pages of advertising. They probably weren’t too interesting at the time but, 70 years on, have a delightful period feel. I wonder in particular what sort of a culinary experience dining at Strathdee’s restaurant might have been? Unsurprisingly various search engines indicate it is no longer trading, certainly under that name. The first page of text contains a letter of welcome from the President of the Aberdeenshire Cricket Club, friendly and informal, but with a not entirely gentle dig at those who generally allocated ‘big’ fixtures in Scotland to Glasgow and Edinburgh. There follows a tribute to Bradman, not in itself containing anything remarkable other than an assumption from its author that, whilst acknowledging that Bradman was the greatest run getter the game had seen, in the future others would match him. These days the idea of another Bradman appearing seems to be far-fetched to say the least, but it seems that was not the case in 1948. The brochure cannot have been prepared too long before publication because there is a look back at the events of the summer’s Ashes. Contemporary English writers, some might call them ‘whinging poms’, tended to make excuses. Their Australian counterparts were either very ‘Australian’ in their attitude or completely objective, and to be fair in some ways that was a distinction without a difference. The Scottish viewpoint is entertaining – as Sir Andy Murray famously made clear before the 2006 FIFA World Cup those north of the border have their own take on English defeat. As any such brochure almost inevitably includes, there are a selection of pen portraits of the visitors, all of course better known than their Scottish opponents, but they are all introduced as well. In addition there is a very well written five page history of the Aberdeenshire club and, in the centre pages, a large photograph of the tourists ringed by facsimile signatures. What the brochure could not deal with was the cricket that was actually played. 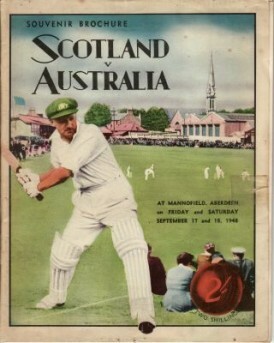 Unsurprisingly the Australians had a gentle work out winning in both Edinburgh and Aberdeen by an innings. Bradman paid his hosts the great compliment of playing in both matches. He scored just 27 in Edinburgh, but treated the Aberdeen crowd to an unbeaten 123. There wasn’t a great deal of success for the Scots, and some small consolation for the English in that the home side’s two most successful batsmen, Guy Willatt (later to captain Derbyshire) and Tom Crosskey, were from Nottingham and Hastings respectively. A casual reader/collector of cricketing books and memorabilia is unlikely to be too keen on shelling out the sort of cash it would take to acquire a copy of Scotland v Australia for their own collection, but if during a visit to a dealer or an auction there is a copy around do have a look. You will certainly enjoy what you read, and might even be tempted to break the bank. *My good friend Richard Miller, who I suspect knows as much about Scottish cricket as anyone alive, assures me this would have referred to a local rather than national record. Sounds like a fine read. David tells me that Alan Dedicoat draws the lottery numbers on the BBC (this will make more sense when you read the review).